March 8-23, 2014 was the 11th time that the Atlanta Preservation Center brought together the organizations and individuals of the preservation community to demonstrate the value of Atlanta's historic built environment. 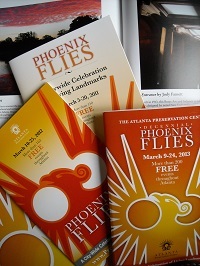 The Phoenix Flies: A Celebration of Atlanta’s Historic Sites was created in 2003 by the Atlanta Preservation Center as a way to celebrate the 25th anniversary of the dramatic rescue of the Fox Theatre, an event that changed Atlanta’s preservation outlook forever. 2014 was the 11th time that the APC brought together organizations and individuals from the community to demonstrate the value of Atlanta's historic built environment. During its history the Celebration has presented 1,250+ events and provided 36,000+ free opportunities to experience Atlanta’s rich historic fabric. The Celebration has grown from 16 Preservation Partners and 40 events to 82+ Partners and 240+ events. Here are some links to previous Phoenix Flies Celebrations. The phoenix is a mythical, flying creature that is born from the ashes of its own incineration. Like this powerful creature, so too was Atlanta reborn from her ashes after the Civil War. The phoenix has been a part of Atlanta’s seal and has served as her symbol since 1887. In creating a celebration of Atlanta’s living historic fabric, the Atlanta Preservation Center looked to this magical creature to represent the City.